When I was a kid, we took one vacation a year. It was to Rehoboth Beach, Delaware for a week. I have so many great memories from those weeks, but one thing always comes back to me: once the sun set, it became chilly. Nightly strolls on the boardwalk required an extra layer of clothing. These days instead of visiting the beach once a year, I now live at the beach year round. And though we like to think that all days at the beach are warm and sunny, it's not necessarily true. 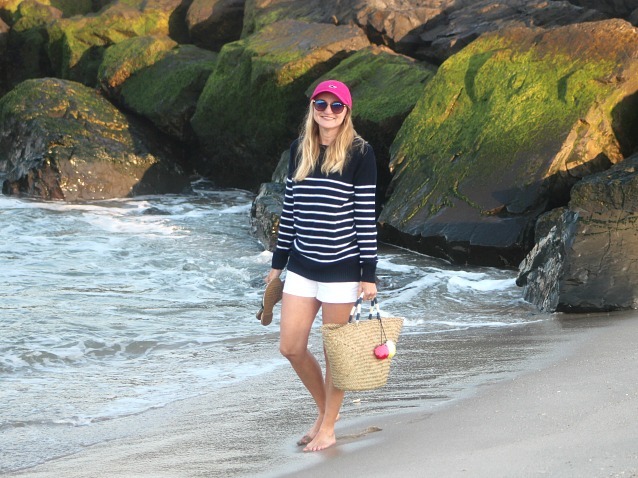 There are plenty of occasions that warrant an extra layer (or two) at the beach. If you're planning a beach vacation this summer, it's a good idea to invest in a good beach sweater. 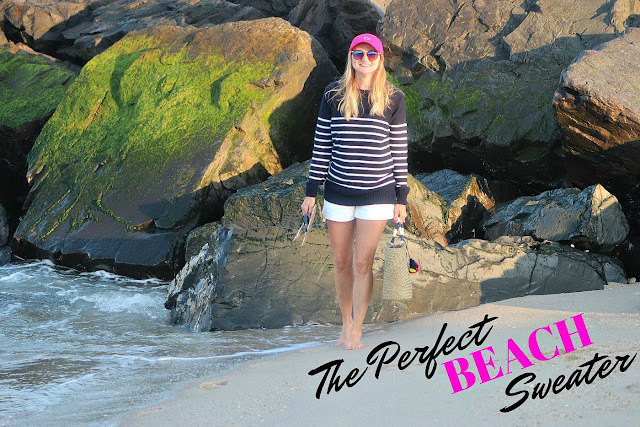 What is the perfect beach sweater? I like a sweater that offers coverage but isn't bulky or chunky. Save those types of sweaters for winter. I also love a sweater with a nautical look and feel. 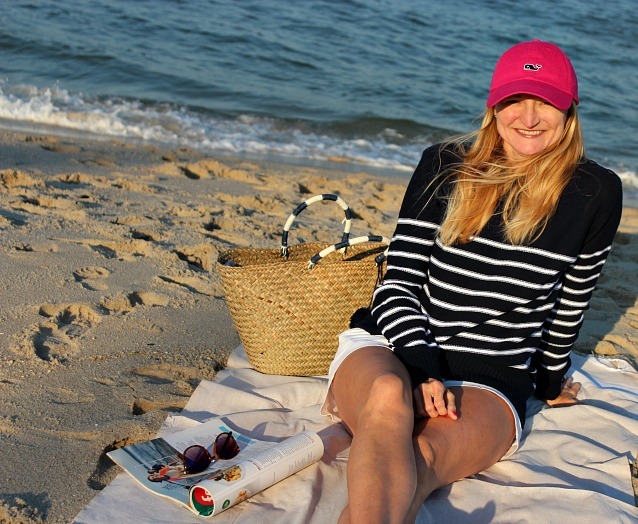 A sweater with stripes, or one that features an anchor or a lobster fit right in at the beach. 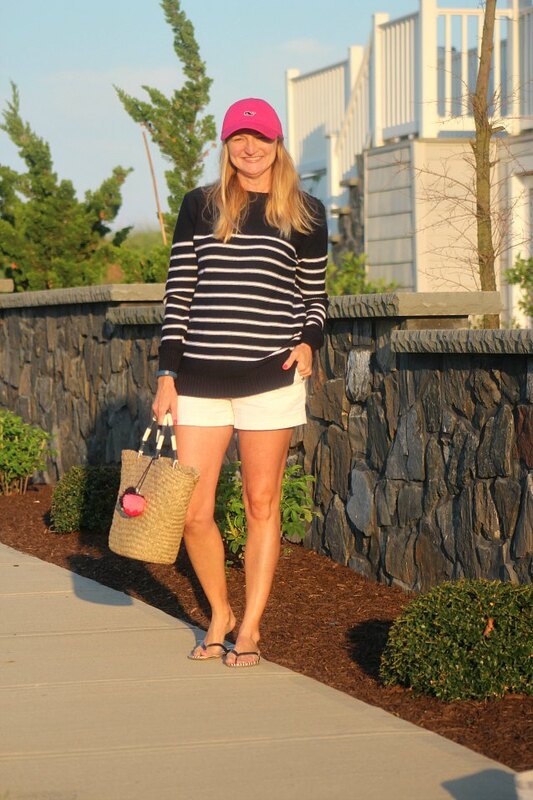 When I found this navy and white striped sweater from WoolOvers, I knew I had found the perfect beach sweater. It's made exclusively of cotton and features side-hem splits and a faux button-up shoulder. This lightweight sweater works for cool spring days or summer evenings when the sun has gone down and the chill has set in. This sweater has become the one I reach for over and over again. I love its versatility. I've worn it with white shorts (as shown), white denim, regular denim, and plaid shorts. It would look fabulous paired with white or denim skirts. I'm all about easy when it comes to summer dressing. This sweater is easy-wear, easy-care, and it travels well. Doesn't wrinkle, and once you reach your destination, you can grab and go! Click here to shop this sweater. Check out the full collection of WoolOvers apparel here. Follow WoolOvers on Facebook and Instagram. Thanks to WoolOvers for providing product to facilitate this post. All opinions are my own.